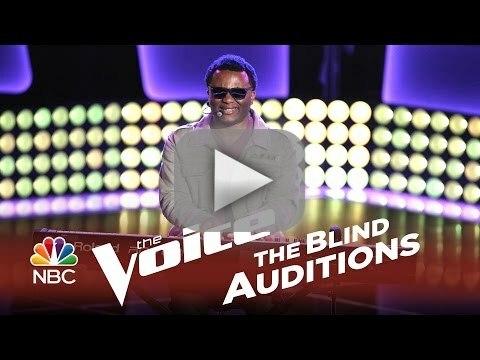 The Voice Season 7 Episode 3 Recap: Blind Auditions Take on New Meaning by Celebrity News and Gossip, Celebrity Fashion Guide, Celebrity Beauty tips, Celebrity Hairstyles 2013, Celebrity Style 2013 and more! On The Voice Season 7 Episode 3, more aspiring singers left their hearts on the stage as they vied for spots on one of the four celebrity coaches’ rosters. One of the contestants was actually blind! Blessing Offor was a bit uneven through the first two-thirds of “Just the Two of Us,” but his charisma and raw talent got all four chairs to turn. He was a Blessing to watch on TV, with his positivity as well as his take on the classic song, but he has work to do when he joins Team Pharrell. Meanwhile Jessie Pitts’ rendition of “The Story” earned a spot on Team Gwen, although like Blessing, it’s unclear if this is flash in the pan or next level talent. Ricky Manning, who sang “Love Me Again,” joins Blessing on Team Pharrell, which is quickly becoming the Island of Misfit Toys of aspiring vocalists. Can he craft them into a winning roster? Very possibly, but it’ll take effort, because people like Mia Pfirrman, who hit some great notes on her audition. Listening to her sing Katy Perry’s “Unconditionally” left Adam swooning, although there’s a personality gap there that he might need to help her with. Kelli Douglas, who performed “Danny’s Song,” made for an unexpected choice from an unexpected face, but she overcame stage fright and then some. Not unlike Pharrell, Adam has his work cut out with these two if he wants to make them into contenders who can survive through public voting. Bree’s tone was so gravely, Blake probably would have crawled across a bed of nails to get her based on that alone, but she had talent as well. Later in the episode, we were introduced to Troy Ritchie, whose rendition of “Out of My League” made up for his Family Guy quotes and won over Gwen. The best performer of the night was Anita Antoinette, with her rendition of “Turn Your Lights Down Low,” made up for lost time since her Season 3 failure. Team Gwen scored a gem with this one. Think she has what it takes to win Battles, Knockouts and Votes from The Voice viewers? We will soon see. Who was your favorite singer on The Voice Season 7 Episode 3? Which coach do you like best of the new panel? Share your comments with us and discuss below! Copyright © 2011 - Celebrity News and Gossip, Celebrity Fashion Guide, Celebrity Beauty tips, Celebrity Hairstyles 2013, Celebrity Style 2013 and more!